The EUR/USD pair ended the day marginally higher a handful of pips above 1.1900, having posted a fourth consecutive lower low daily basis, this time at 1.1837. The American dollar got a limited boost from local encouraging data, as inflation rose 0.4% percent in August on a seasonally adjusted basis, while from a year earlier, the all items index rose 1.9%, both above market's expectations. Core YoY CPI came in at 1.7%, matching July's figure, but above the 1.6% estimated. Also, unemployment claims in the week ending September 8, the advance figure for seasonally adjusted initial claims was 284,000, a decrease of 14,000 from the previous week's unrevised level of 298,000. The dollar jumped on the news, but its rally was short-lived, as there was no follow-through in equities of the latest bullish run, whilst a surprisingly hawkish BOE sent the Pound skyrocketing, hurting the American currency. Bulls are not ready to give up, as after multiple failed intraday attempts, the pair finally regained the 1.1900 level. 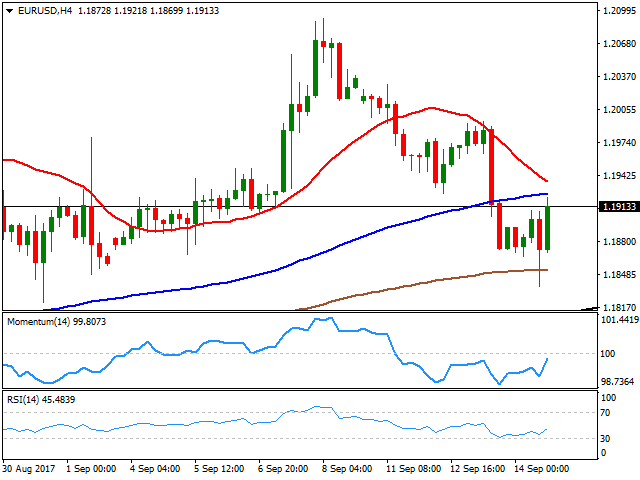 Ahead of Friday's opening the pair retains its bearish stance, as in the 4 hours chart, the price is developing below its 20 and 100 SMAs, with the shortest about to cross the largest to the downside and both around 1.1920/30 providing a dynamic resistance zone. In the same chart, technical indicators have bounced within bearish territory, but remain well below their mid-lines. The pair would need to surpass the mentioned 1.1920/30 region to be able to regain some upward potential, and approach the 1.2000 figure.